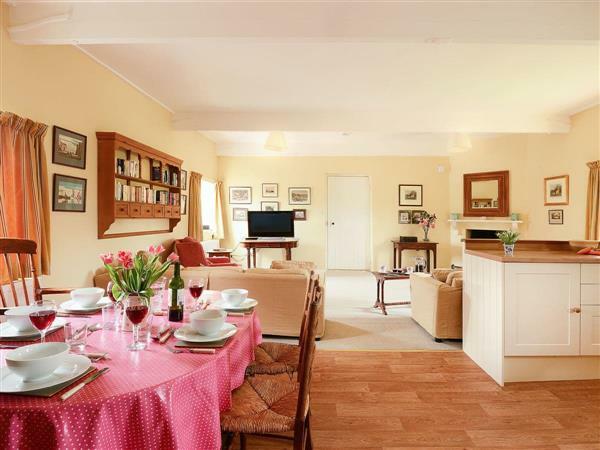 Barningham Hall Stable in Matlaske, near Sheringham, Norfolk sleeps 6 people. Barningham Hall Stable near Sheringham sits within grounds that were landscaped in the early 19th century by the great landscape designer Humphry Repton, and is set within 500 acres of parkland that is a haven for wildlife. Guests will find themselves in an idyllic setting made up of grazed pasture, woodland, a lake, pond and a church with a romantic ruined tower. There are walks through the park and woodland to be enjoyed, virtually from the front door. Barningham Hall Stable dates back to the 17th century and is the upper storey of the original coach house. It has been lovingly converted by the owners of Barningham Hall, a working estate with beef, sheep and arable, to provide comfortable and welcoming accommodation for guests wishing to stay somewhere with real history, that is also in a great location. The hall itself is a privately owned, Grade I listed Jacobean red brick house built in 1612 by Sir Edward Paston, and his coat of arms with the date 1612 are carved in stone above the front door of the house. It is certainly hard to describe the feeling you get as you drive along the manicured pathways and the hall first comes in to sight, but it is a feeling that will remain with you throughout your stay, along with the wonder at being able to stay on, and experience, such a wonderful location for yourself. If you can tear yourself away, you will find the gateway to the Norfolk coast within easy reach, with the seaside town of Sheringham just 15 minutes away. Here you will find Sheringham Park, some 1000 acres of natural landscape and coastal walks, North Norfolk Railway offering steam train journeys and a lovely beach and bustling town. You can head east to Cromer with its famous pier or west to Blakeney for a spot of crabbing. For a change of pace, travel to the nearby town of Aylsham and take the Bure Valley Railway to the gateway of the Norfolk Broads, Wroxham. Or head to Norwich with its splendid Norman castle and numerous galleries, museums and attractions. With the National Trusts Blickling Estate close by too, you really will be spoilt for choice and, after a busy day out and about, you will look forward to returning to Barningham Hall Stable for a great night’s sleep. The beach is 6 miles from Barningham Hall Stable near Sheringham. With the shop, pub and restaurant 3 miles from Barningham Hall Stable. Living area: With wood burner, 50 Freeview TV and DVD player. Bedroom 1: With super king-size bed and en-suite with shower over bath, and toilet (also accessed from hallway). Bedroom 2: With king-size bed and en-suite with shower cubicle and toilet. Bio mass central heating, electricity, bed linen, towels, Wi-Fi and logs for wood burner included. Highchair. Welcome pack. Lawned garden with sitting-out area, garden furniture and barbecue. 500-acre grounds (shared with owners). Bike store. Private parking for 3 cars. No smoking. Please note: There is a pond in the grounds, 110 yards away. Holidays at Barningham Hall Stable run from Friday to Friday. For a better idea of where Barningham Hall Stable is, you can see Barningham Hall Stable on the map below. Barningham Hall Stable is in Norfolk; should you be on the lookout for a special offer, you can find all the special offers in Norfolk. It's always worth checking to see what is on offer at the moment. Do you want to holiday near Barningham Hall Stable (UKC3426), you can see other cottages within 25 miles of Barningham Hall Stable; have a look to find your perfect holiday location.